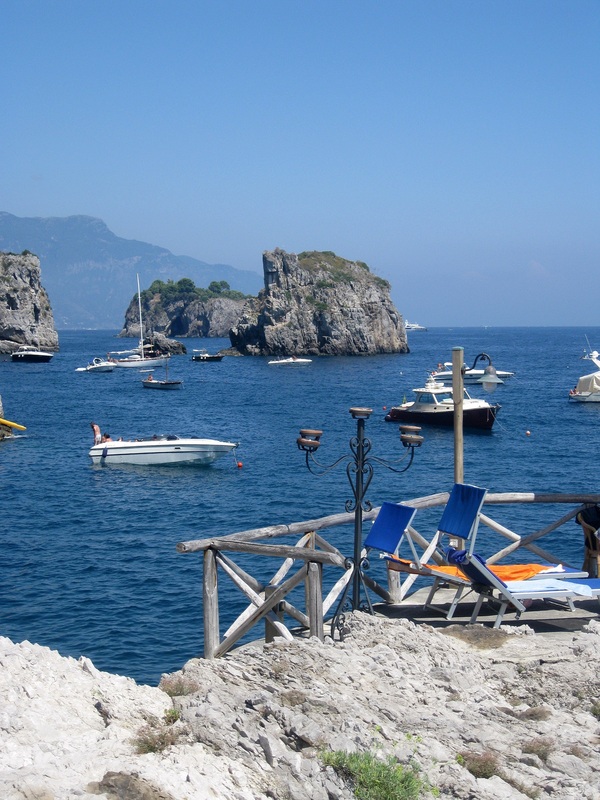 Amalfi coast is probably – in my opinion – the most panoramic and picturesque place in the world. 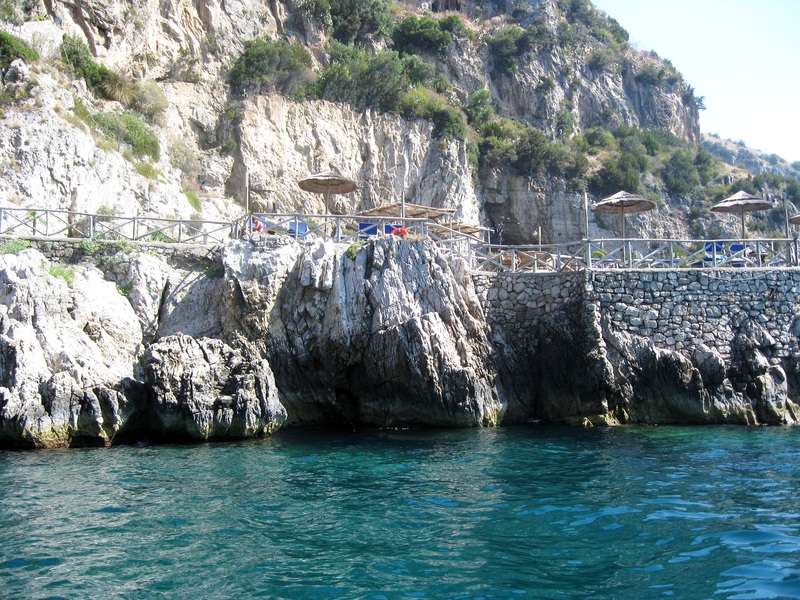 Because of its unique topography and landscaping, Costiera Amalfitana – like Italians call it – is one of the most visited spots in the Mediterranean during summer. 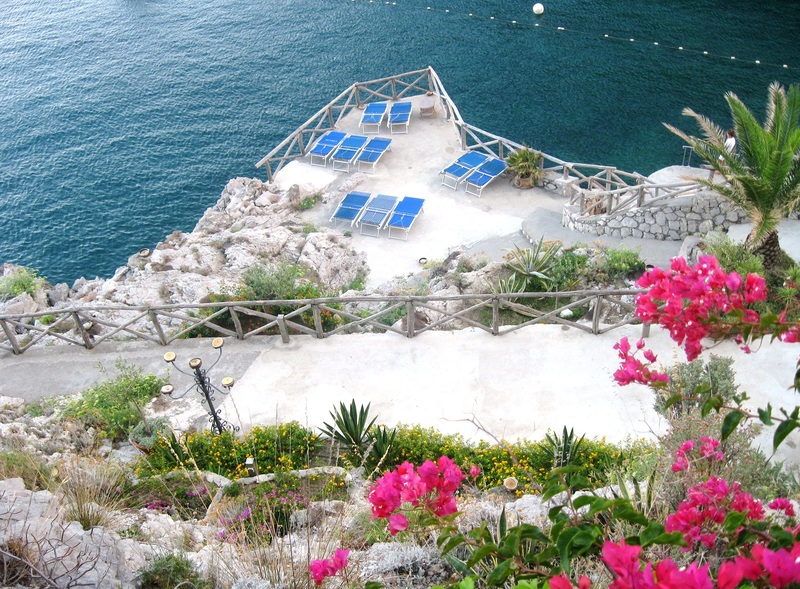 Unfortunately due to its popularity, Amalfi Coast has become a touristy zone and very expensive, therefore it is easy to fall into turist traps. However, there are still beautiful uncontaminated places in this wonderful area – some well kept secrets by locals, as well as by a few well-traveled visitors. 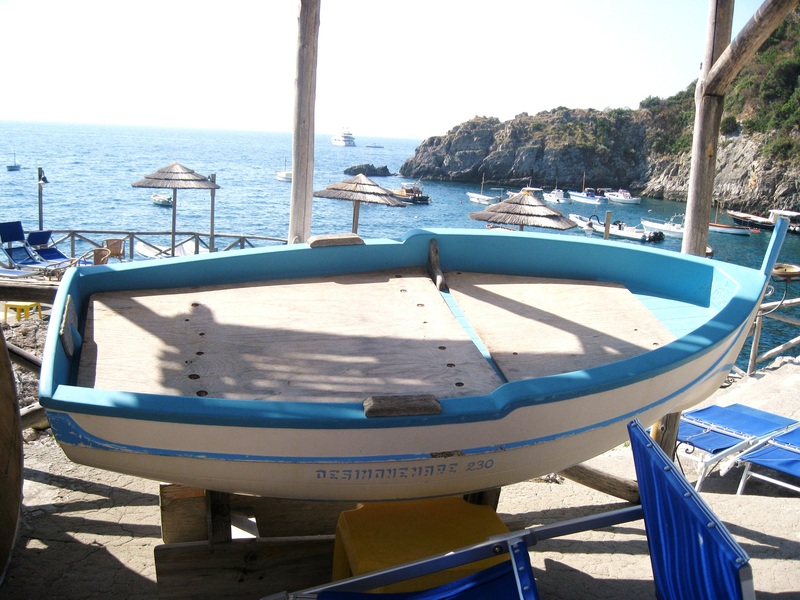 This is the case of Conca del Sogno – meaning ” The Basin of Dreams”, a family owned restaurant that has successfully been in business since the 1960’s. 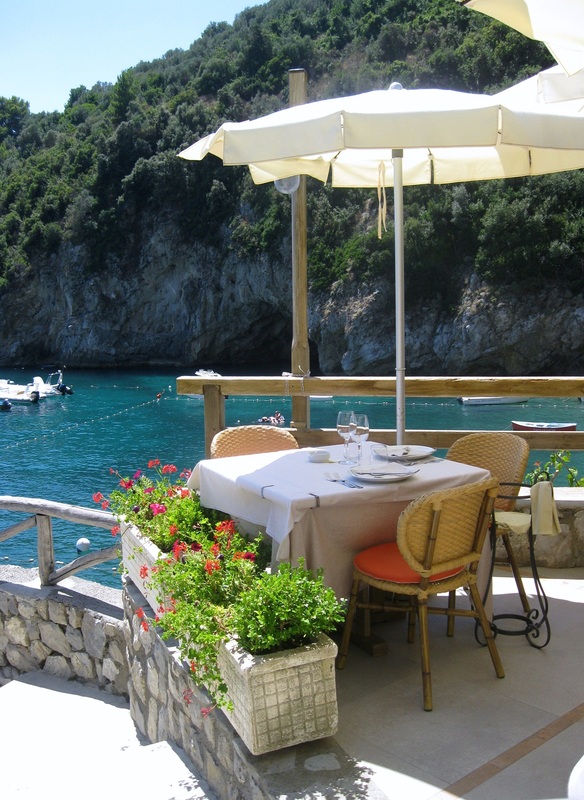 The “dream” began with Mr. Pietro Tizzani’s great vision, who had the wise idea of creating a tiny restaurant offering fresh, local, high quality produce and seafood. Convinced of the strategic location and the beautiful nature surrounding the spot, Mr. Tizzani – with his wife Giuseppina – saw an opportunity to start a family business that will be passed through one generation to another. Nowadays, the tradition has been transmitted to their children Anna, Orlando, Antonella, and Francesca, who run the place with the same love, devotion, and professionalism as their parents taught them. 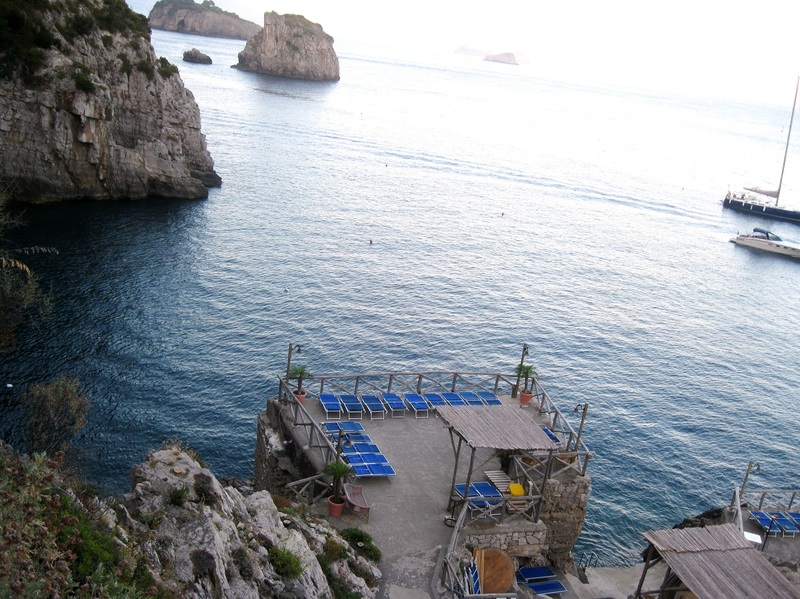 Being consciously aware of the ever evolving and demeaning restaurant business, the second generation has had the clever idea of expanding the business by also offering some cozy rooms, on-premise catering, and most importantly, a stunning bathing area overlooking Isola dei Galli. What is most impressive about the way this family runs the business is the “savoir faire” with all their costumers. You can offer the best location with the greatest food, but if the service is lousy and unfriendly, a place is worth nothing. The Tizzanis really pamper their customers. They make you feel at home with their warmth and kindness, and they have made sure that their staff transmits this mentality to customers. With third generation involvement in the business through Irene (Orlando’s daughter), and Christian (Francesca’s son); Tizzani’s family assuredly will be exceeding customer expectations for years to come. 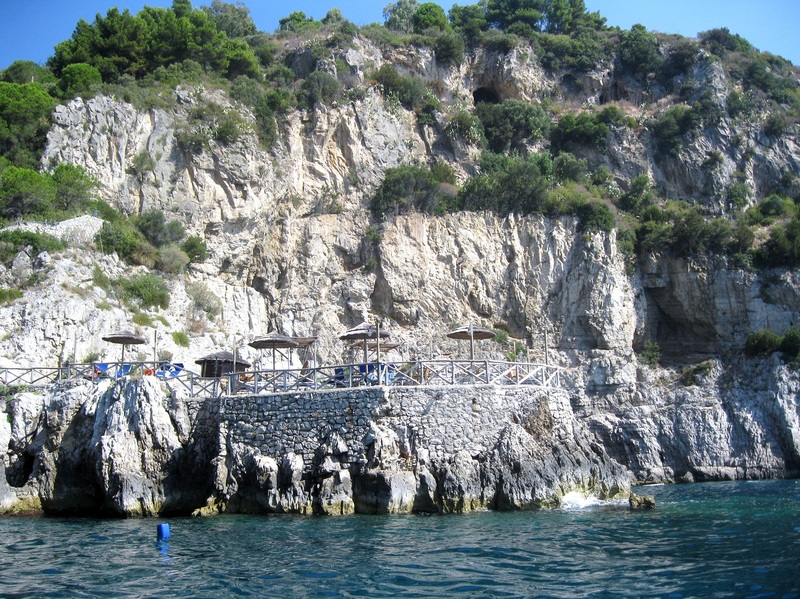 This is a stunning view of the sun bathing area from a boat we rented for the day. Another angle of this “dreamy” basin. 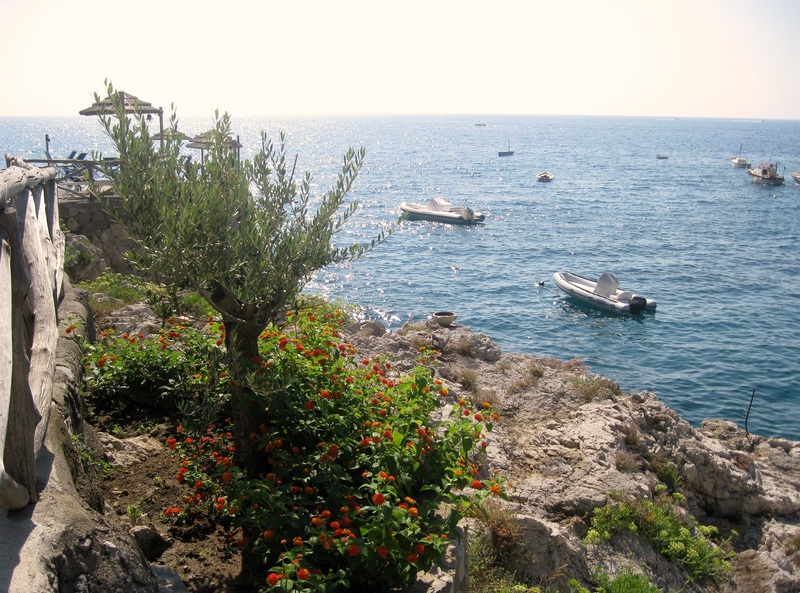 The landscaping of Conca del Sogno features very well-groomed green areas. The sun bathing area is divided into three levels. This is a view of the top level overlooking some islands. I just loved the dazzling effect of the sunlight on the sea with the brightness of the contrasting colors of the vegetation – simply gorgeous. For every seaside location I go, I like to point out the crystal clear waters of the beaches, something we cannot take for granted nowadays. I judge a place by its details. Look at this fascinating boat placed besides some sunbeds. 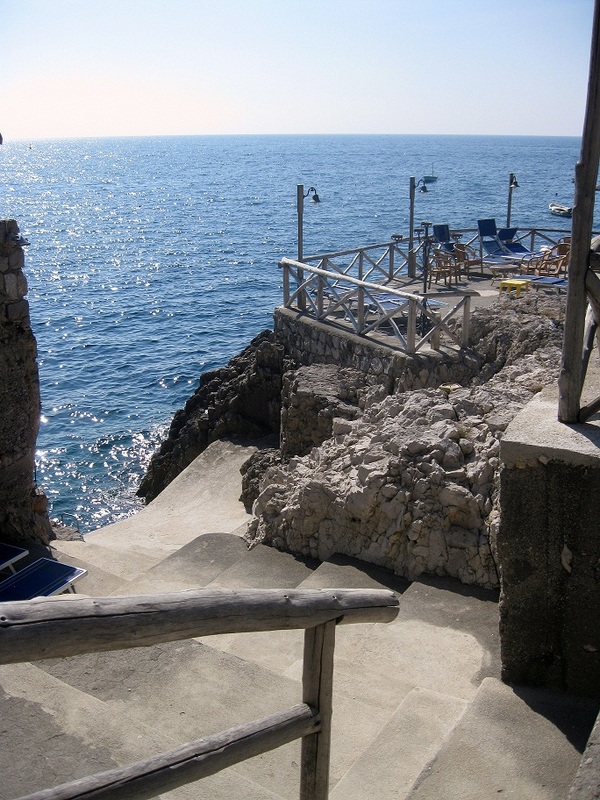 This is the way to get access to the sea from Conca del Sogno. Being brought up by the Caribbean Sea with marvelous white, sandy beaches, I could not get used to this type of bathing. In the beginning it was scary, but once you get used to it, you truly enjoy the sea! Another view of the sun bathing area. The top deck of the sun bathing area. 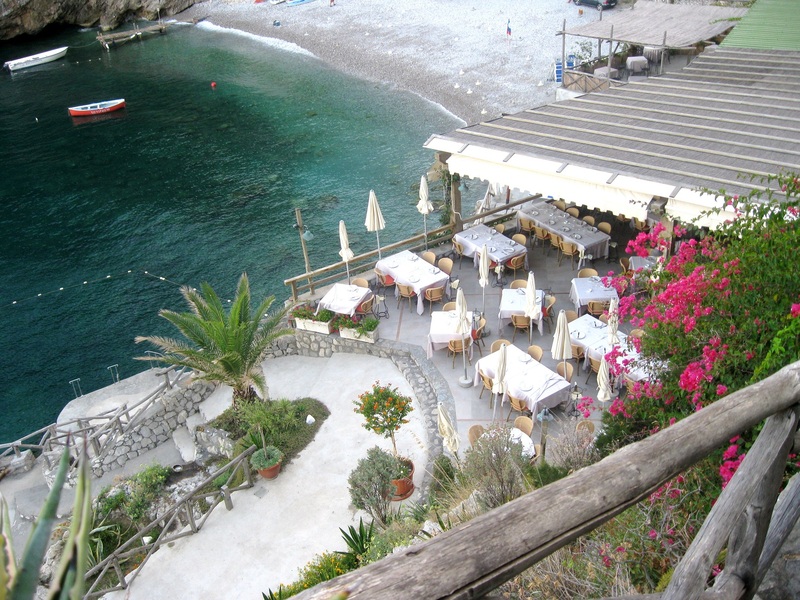 The best view you can get from Conca del Sogno. The fascinating view from the dining area. 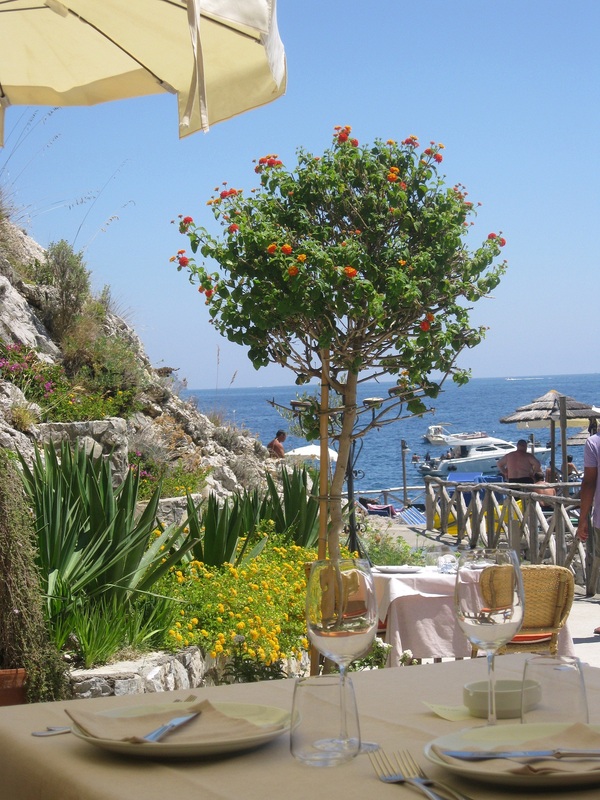 Another view of the dining area overlooking the beautiful sea. A top view of the dining area. I insist: the contrasting colors of this place are just amazing. 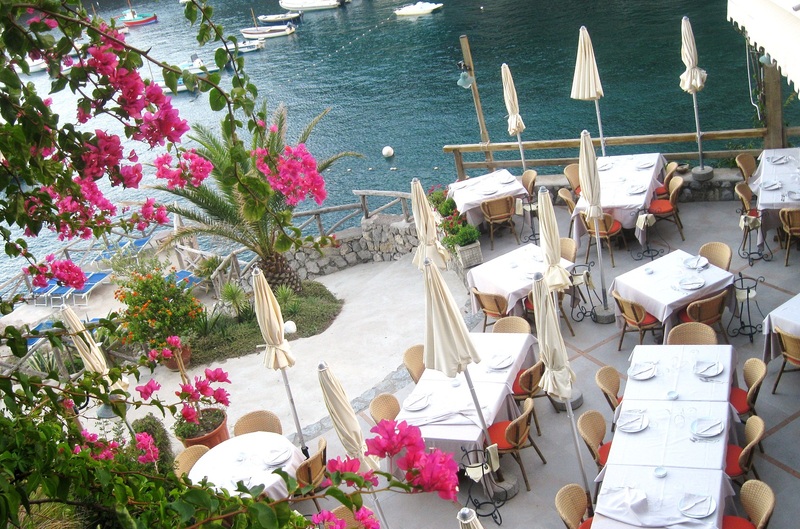 Now let’s get down to serious talk: Conca del Sogno’s food. This is a pre-appetizer you are given as default. 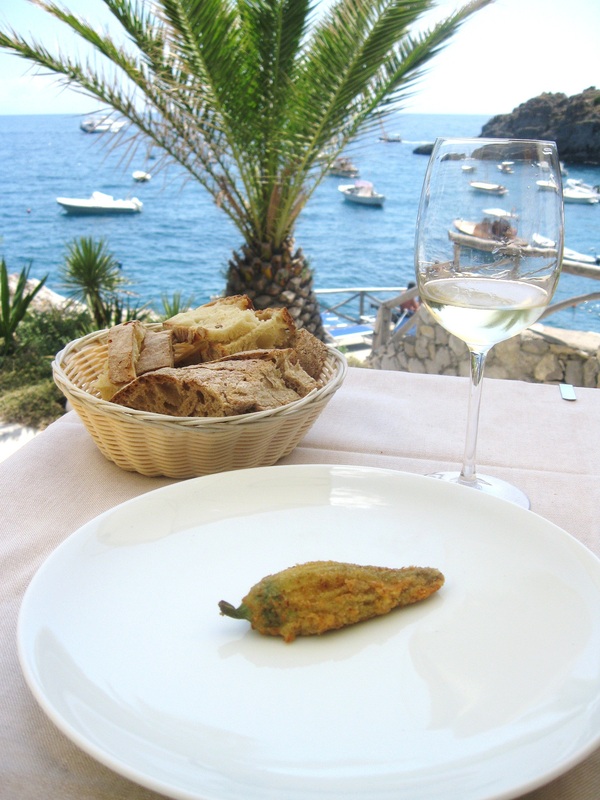 A mouth-watering fried zucchini flower stuffed with creamy, local ricotta cheese. It is served hot and it melts in your mouth! The dish is fragrant, crunchy on the outside, velvety on the inside. Just perfect!! This is an appetizer featuring local seafood and, most importantly, sweet cherry tomatoes with arugula, and mozzarella from Agerola, a nearby small town famous for its “treccia” di mozzarella (treccia in Italian means braid). Fried crunchy fresh calamaretti (small calamari). Contrary to popular belief, in Italy this dish is paired with just lemon juice instead of classic marinara sauce (which is not Italian at all). 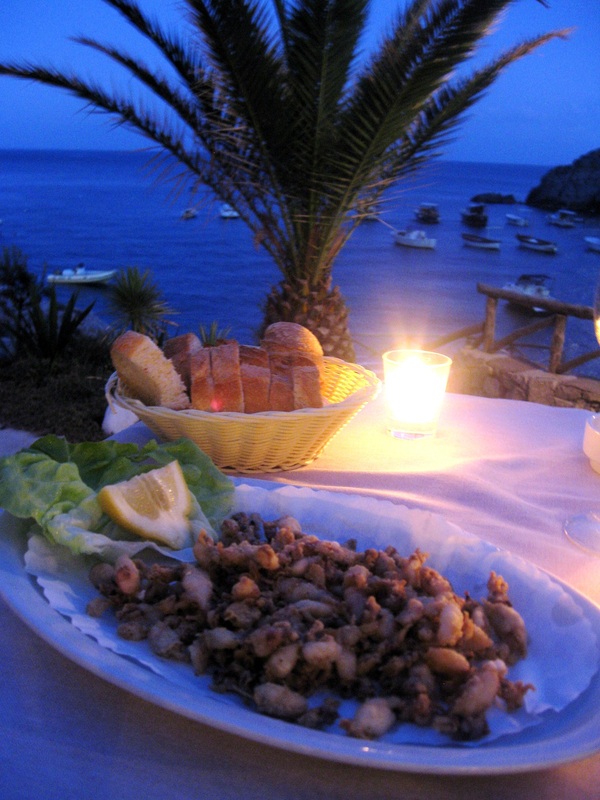 Why would you want to cover the real taste of freshly catched calamari? 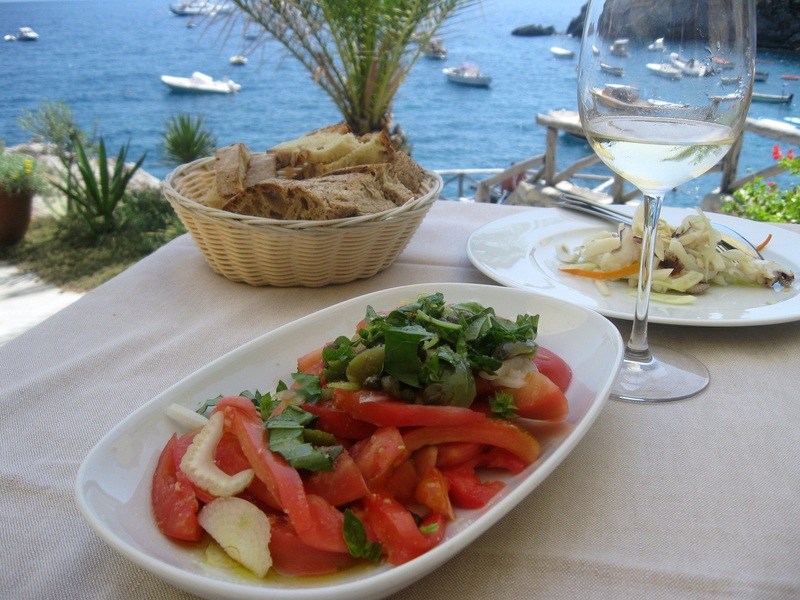 Fresh tomato salad with capers, olives, white onions, celery, and fresh basil. This is how a simple salad can become a real indulgence when used hight quality ingredients. Calamari salad with fennel, almonds and carrots. The addition of crunchy almonds created a great contrast with the soft texture of the calamari; the fennel just added that freshness for an amazing appetizer. 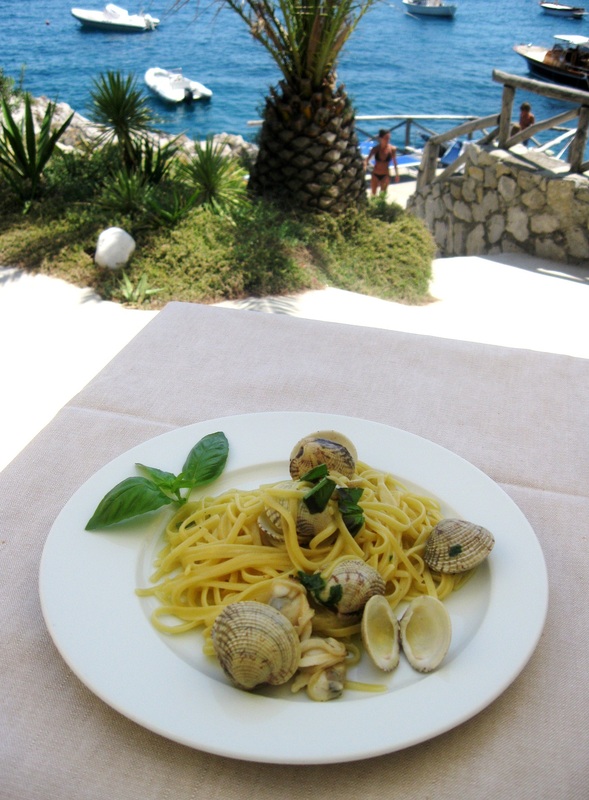 Pasta with tartufi di mare. Tartufi di mare are a type of shellfish similar to clams, but the difference is that these are bigger in size, they have a richer taste, and the surface is rougher. 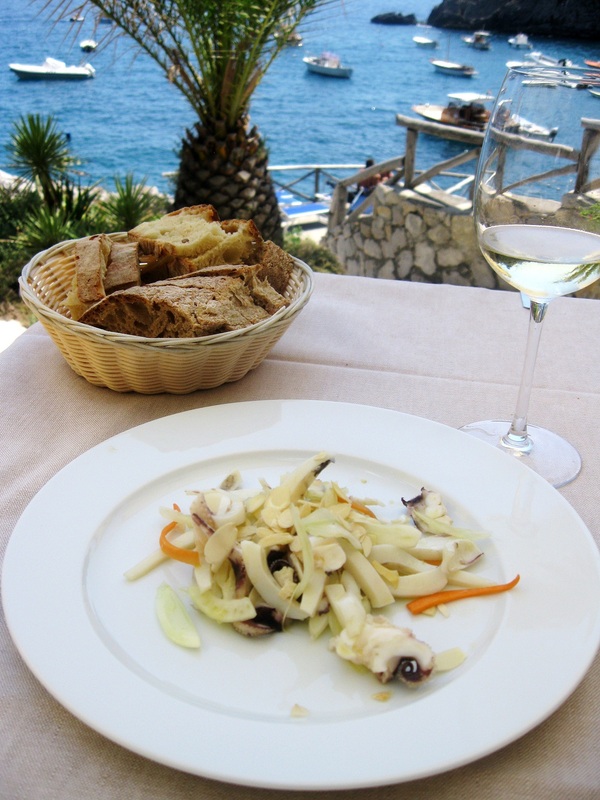 These are very common in Italy, particularly in Puglia, Friuli Venezia Giulia, and the Gulf of Naples. Campania style Eggplant Parmesan. I am not going to describe this dish since most of us have already tasted eggplant parmesan before and therefore, we are familiar to its taste. However, l want to emphasize the lightness of this dish, which is a rare quality in a rich dish featuring fried eggplants. 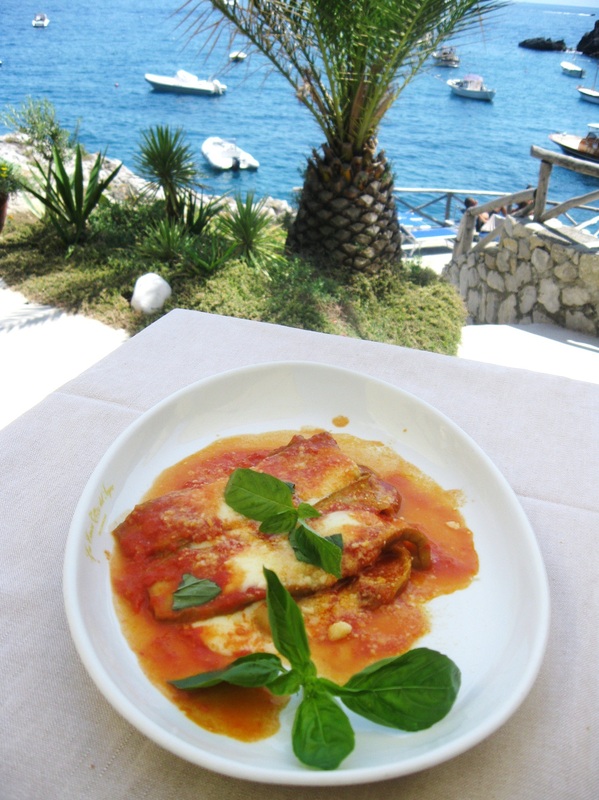 You can find a recipe of an eggplant parmesan similar to this in my post Eggplant Parmesan – an Italian classic . Limoncello. 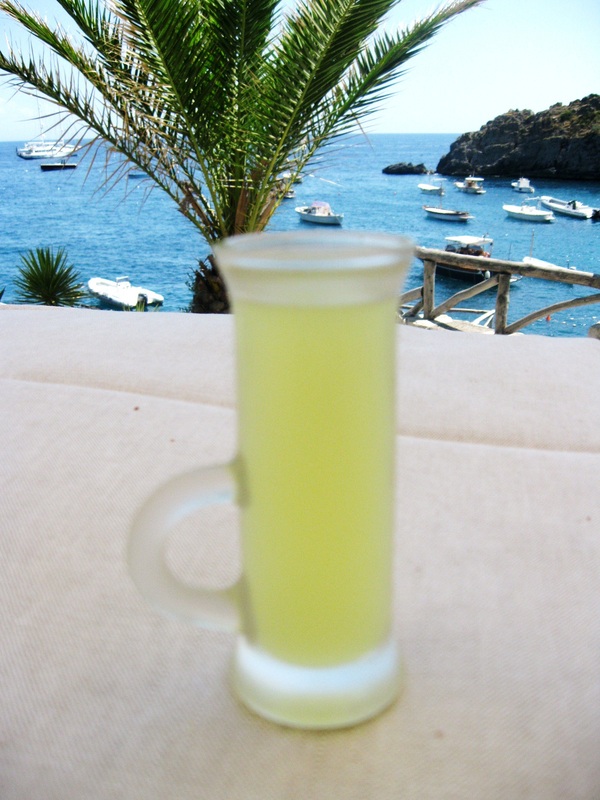 When photographing limoncello, you have to focus on limoncello (of course!). Somehow, after some glasses of white wine, I focused on the view behind…and makes me wonder…. 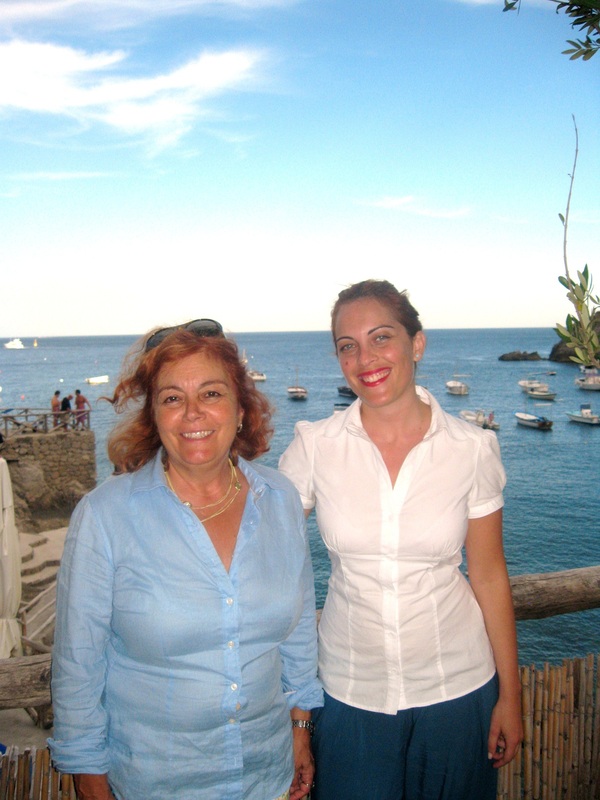 Two beautiful Italian women: Anna and Irene Tizzani, second and third generation owners. 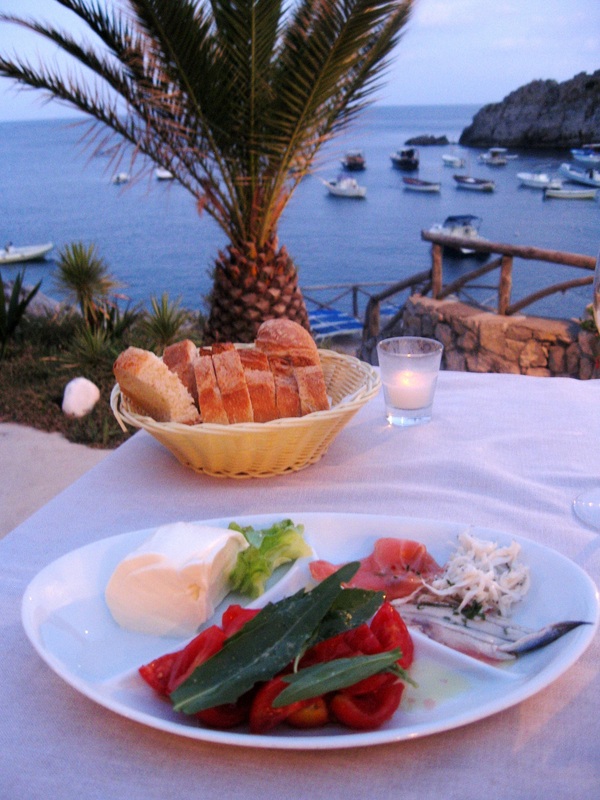 That is truly heaven – for me, Italy is the only reason I would travel out of France. Brilliant description of a heavenly place. I just wish you hadn’t told so many people. Dreamy views, wonderful and limoncello. What more could you want? There is but one Amalfi and your post brought back some wonderful memories. Thank you for that. Where are you taking us next? You are welcome!! Due to work reasons (gotta go back to work! 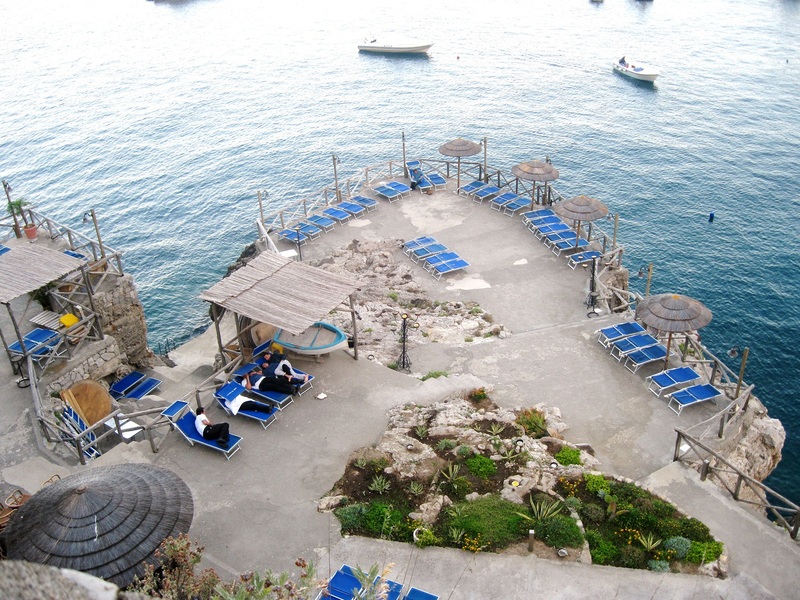 ), Amalfi will be our last stop for now. 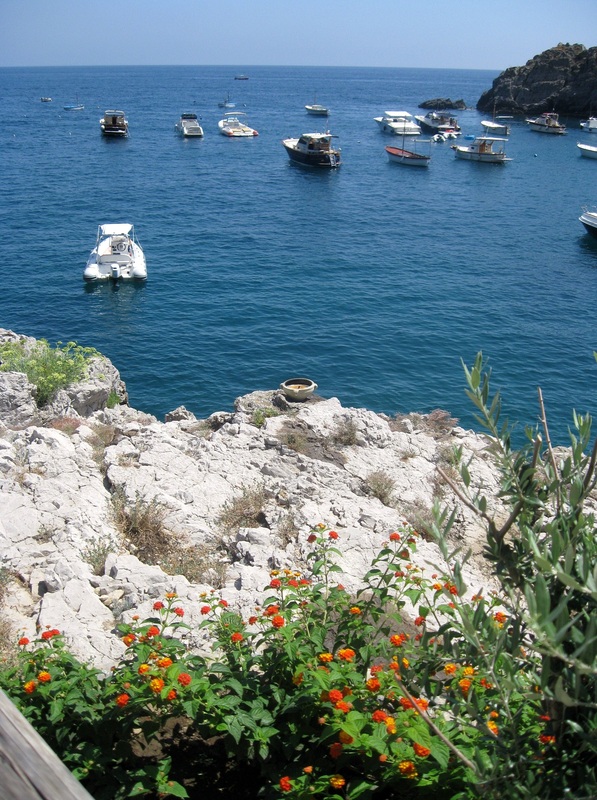 I will be posting more on Amalfi though! Absolutely beautiful photos. I wish I was there right now! Thank you!! The photos does not portray the real beauty of this place though!! Bellisimo Gisi! Wish I was there! Bueno cuando viene a visitarme. Asi la llevo!!! 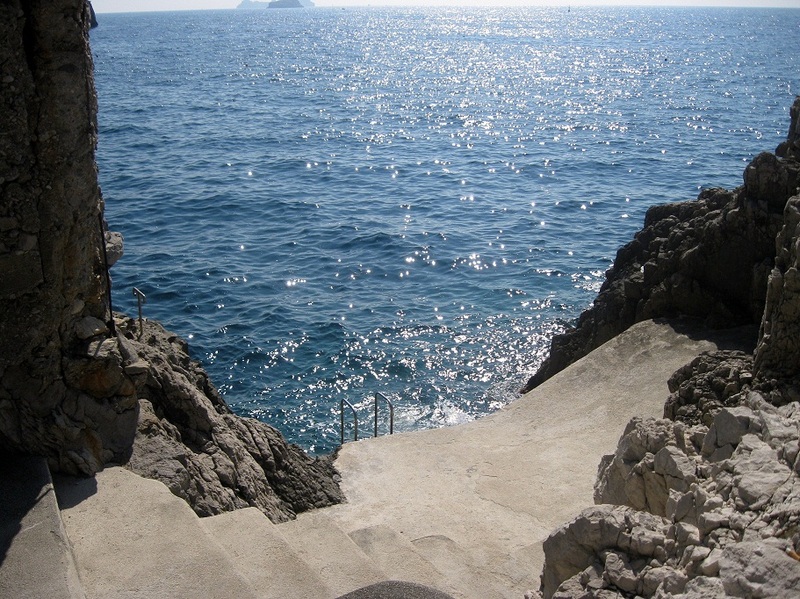 The Amalfi coast is so beautiful. It’s been too long since we visited that area of Italy. Thank you for bring back lovely memories. 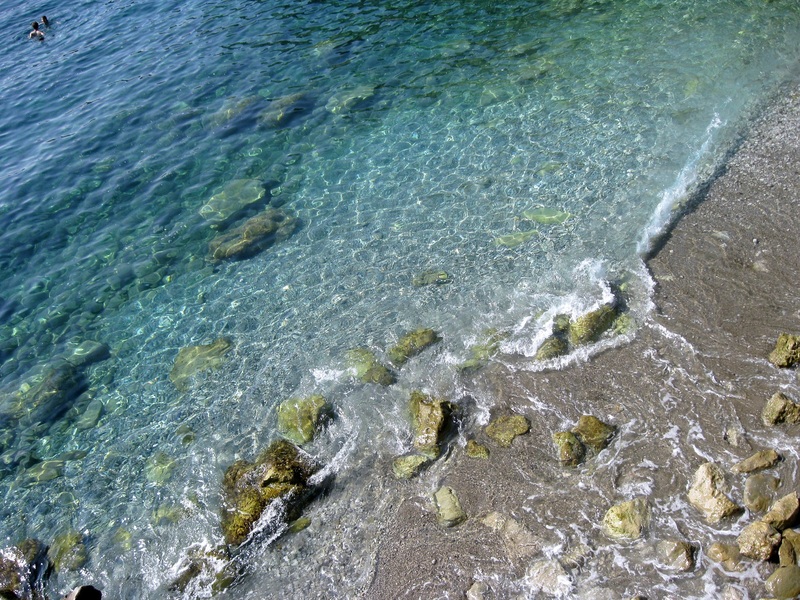 So beautiful, amazing views, the water so crystal clear and blue. I love how the food is so light and simple in presentation. I can just look at those photos and imagine the fresh, clean taste. I have to agree with the calmari in lemon juice and not marinara sauce, I enjoy it much better that way than being drowned out in sauce. Brava!! The food is simple becasue it is fresh!! Ok, so when is your next holiday becuase I´m booking up to go with you! Stunning post, as ever. ¡Enhorabuena guapa! Certainly!! It would be my pleasure! But you have to take me to London or Andalucia!! Vale? I wish I could be there now, we are sat in front of a fire in England, it’s freezing! Lovely photos, lovely food, lovely post. Thank you very much!! I’ve heard of those British cold summers!!! (Brrrrr)!!!! A stunningly beautiful place and wonderful photos. Thanks for your kind words on my challenge post….it’s mutual! Thank you!! I really love your blog!